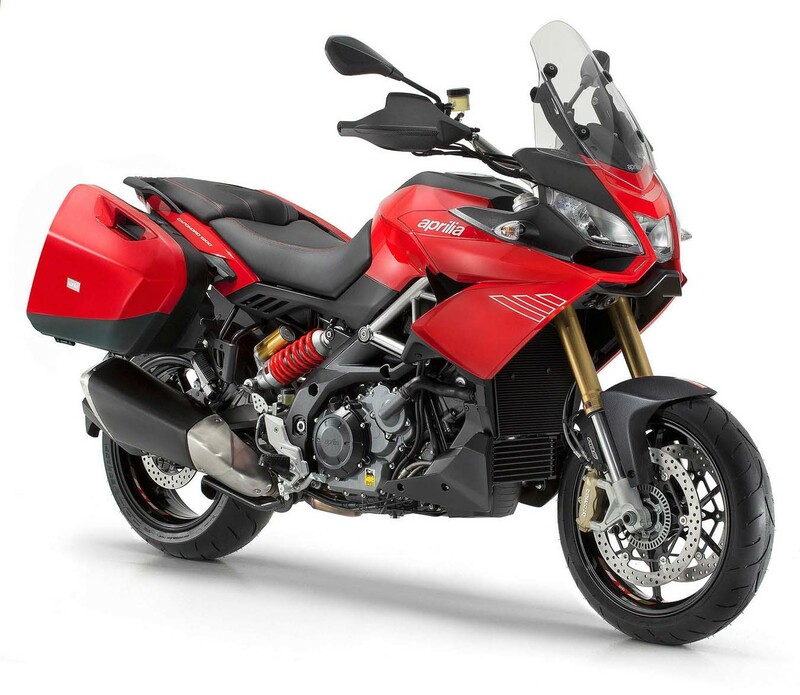 Using years of experience gained from competing at the very top, Aprilia has made their technology available and accessible for everyone on the Caponord 1200. The electronic systems which are unique for their ease of use, effectiveness and reliability, include the Ride by Wire multi-map throttle, Traction Control and two-channel ABS. After shocking the naked sport bike world with the incredible Tuono V4 R and after creating the best superbike of the new millennium, the super fast RSV4, Aprilia aims at leaving an indelible sign in the street enduro segment as well, achieving the exclusive objective of obtaining a perfect balance between sport and comfort. Introducing Caponord 1200, the perfect bike for any occasion. Easy to handle and agile in the city, thanks to its advanced and lightweight chassis, quick and fun in the countryside, thanks to its sophisticated electronic management and its generous twin cylinder engine, comfortable for rider and passenger in touring due to the particular attention to ergonomic detail and its excellent protection against the air, thanks to wind tunnel shape studies. Caponord is not a new name for Aprilia: the first ETV 1000 Caponord, introduced in 2001, represented an advanced interpretation of the street enduro concept, boasting distinctive elements such as the dual beam chassis in aluminium and the 998 cc 98 HP twin cylinder engine, both clearly sports derivations. More than ten years have passed and in the meantime Aprilia motorcycle technology has taken leaps forward: the proverbial ability to build exceptional chassis has been joined by top notch skill in electronics, thanks to the experience gained in top level racing, which has always been the maximum centre of research and development for Aprilia of solutions which are then used in road legal models. Proof of this is in the exclusive equipment (RbW, ABS, aTC, aCC, aDD) and the power delivery, especially the torque of the 1200 V2 engine, completely revamped to provide the maximum in terms of power output and riding pleasure. The needs and desires of bikers have also changed, attracted more than ever by the global bike, a bike capable of providing great satisfaction in any conditions of use. 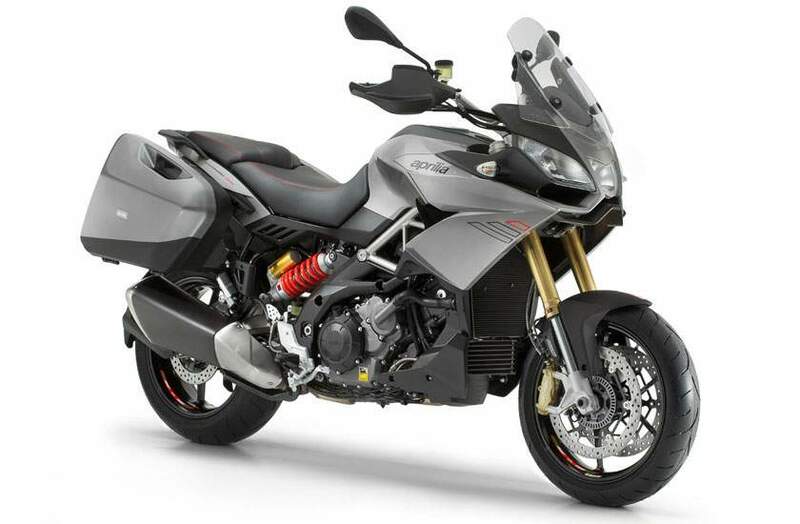 Caponord 1200 aims to establish a meeting place between the new needs of bikers and Aprilia's technological skills. The personality typical of Italian design combined with a sleek body: these are the primary characteristics of a long series that sets the Caponord 1200 apart. Form and function find a point of contact. The sport nature comes through clearly in the stylistic traits: the distinctive Aprilia "gaze" characterises the Caponord 1200 too. Numerous wind tunnel sessions designed the shapes of the top fairing and the height-adjustable windshield in order to ensure the best aerodynamic penetration, with particular attention given to the indispensable protection of the rider and passenger against the wind. To guarantee maximum comfort in touring use, the handguards and particular side fairing profiles come into play, designed not to be invasive, but to offer plenty of protection. The same concept characterises the Caponord 1200 chassis: the Aprilia crossover has a frame made of steel trellis and forged aluminium plates, a true and proper modern sculpture which deserves to be left on display. The mixed structure guarantees the right amount of rigidity and the essential characteristics of stability and precision expected from every Aprilia, allowing the Caponord 1200 to rise above where its rivals stop - in sport riding. The perfect balance between sport and touring is an alchemy that only those with in depth know-how like Aprilia are able to create. The erect and relaxed riding position is the fruit of specific ergonomic studies to find a dominant position, but one that would not be tiring during long trips; the rider seat, enhanced by its elegant red stitching to give it a racing flavour, has a particularly comfortable cushion and sits just 840 mm off the ground, allowing riders of any height to always be in full control of the vehicle at a standstill. A lowered seat is also available as an accessory to further reduce the distance from the ground. The passenger accommodations were also given particular attention: the portion of the seat, large and flat, is separated from the rider's seat and shaped in such a way that prevents sliding forward, guaranteeing optimum comfort in any riding situation, while the grab handles provide a firm and comfortable grip. "Rotational" technology allowed a thin walled nylon tank to be realised with great freedom of shape, favouring a reduction in weight. This way the lateral dimensions were reduced to a minimum and cater to the perfect leg position for the rider. The 24 litre capacity guarantees long range travel with a full tank. The Caponord 1200 design was conceived from the beginning considering the bike panniers as an integral part of the vehicle: this, together with the choice to adopt a layout of the exhaust system with a low silencer, allowed dimensions to be contained significantly. The 29 litre capacity panniers, once installed, stay particularly adherent to the tail fairing profile (total dimensions stop at just 908 mm) and they do not create any inconvenience for the passenger, facilitating mounting and riding comfort. 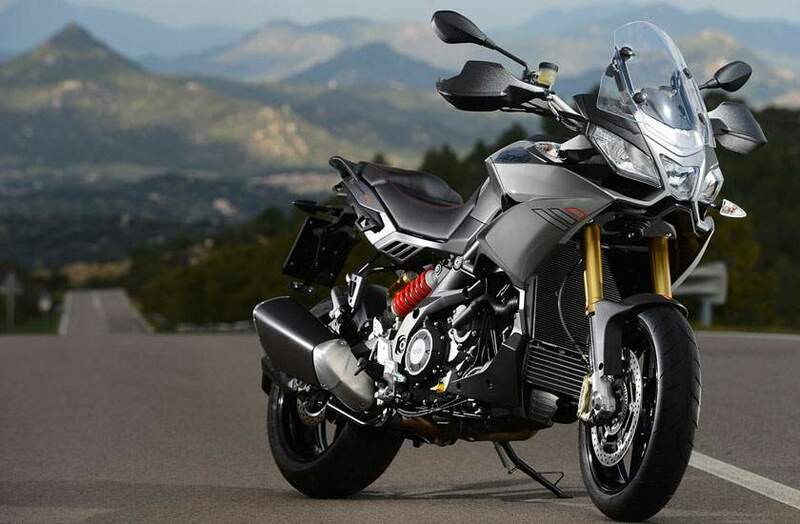 Aprilia also considered sport purists: the silencer is height adjustable, in the event that the panniers are not fitted, giving it a more sporty and aggressive look. The set of panniers, colour coded to match the body and present in the rich original accessories catalogue for the Caponord 1200, does not require any additional brackets or attachments, thereby leaving the clean lines of the motorcycle intact when not installed. The Aprilia V twin engine has been significantly modified to better suit the engine characteristics and has been manufactured with highly advanced manufacturing technology. Great attention has been paid to internal flow dynamics to improve combustion, reduce friction and optimise performance. Even from low revs, the smooth power delivery improves rider comfort and enhances the riding experience thanks to the high degree of torque available. What this means ismore fun with better fuel consumption figures. The triple engine mapping system, which the rider can select even with the bike in motion, lets the rider choose from three distinct personalities each of which can instantly adapt to any possible riding requirement. The layout consists of a mixture of a high resistance tubular steel frame fastened to cast aluminium side plates. This configuration offers a perfect balance between weight and the optimal values of torsional and longitudinal stiffness which add to handling and stability. The new rear subframe ensures stability when travelling fully loaded while the lateral positioning of the shock absorber which fastens the frame to the aluminium swingarm leaves plenty of room for the exhaust manifold. 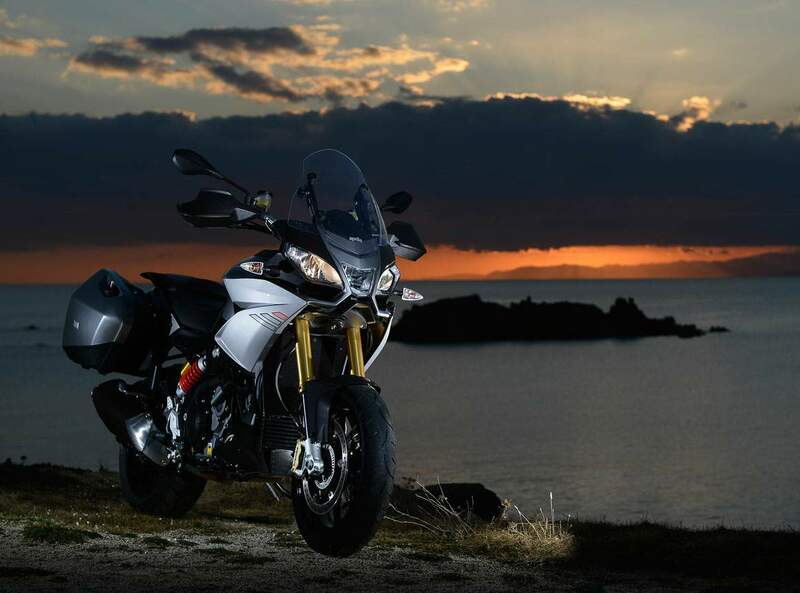 As part of the Caponord 1200 Travel Pack, the forks and shock absorber are electronically controlled by the aDD (Aprilia Dynamic Damping) system. 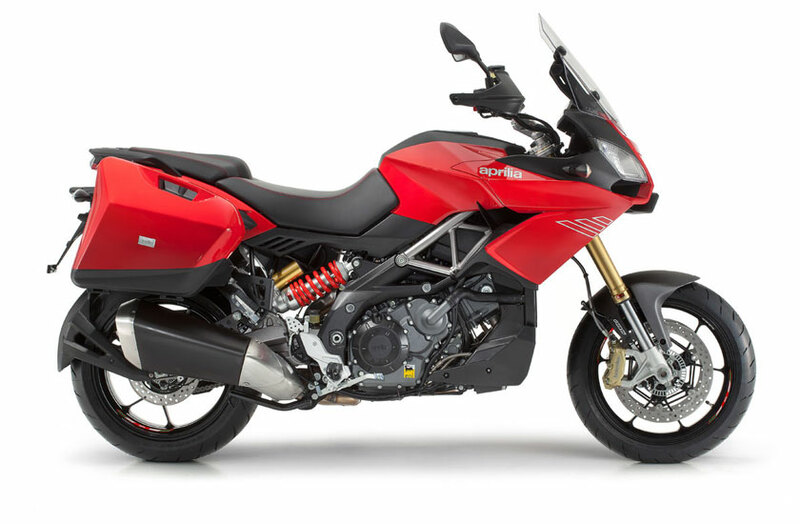 While the Caponord 1200 comes already fitted with a wide range of standard equipment, the Travel Pack version adds a set of 29 litre colour coded panniers, a centre stand, aCC cruise control and the very latest aDD semi-active suspension system with the rear suspension being 100% active (the first motorbike with such a system). aDD (Aprilia Dynamic Damping) is the very latest electronic suspension control system developed by Aprilia and covered by four patents. It is the benchmark in the motorcycling world as regards technology, efficiency and reliability. aDD has two main objectives: one is to maximise comfort and the other is to enhance the rideability and safety of the machine. The system measures the energy transmitted to the bike from the road surface and, in real time, adjusts the hydraulic calibration of the forks and shock absorber to always provide the best possible suspension settings depending on the riding style at that moment, the load being carried and the amount of grip available. To achieve maximum performance at any fork and shock absorber operating frequency, ADD uses a patented “MIX” "comfort oriented" algorithm which combines the principles of the well known skyhook and acceleration driven damping algorithms. In addition to comfort, rideability is also optimised and safety is increased thanks to further software strategies which are tied directly to the rider's actions. In fact, the system recognises different riding phases (acceleration, throttle release, braking, constant throttle) and adjusts the baseline fork and shock absorber settings thanks to yet another patent which allows specific hydraulic calibration curves to be defined within the adjustment range. Aprilia is also the first motorcycle manufacturer in the world to introduce a completely "active" shock absorber which can automatically its spring preload setting. The same multi-function digital instrument panel as fitted to the Caponord 1200 is also found on the Caponord 1200 Travel Pack. The layout of the frame is a mixed structure, made up of a trellis in high resistance steel tubes connected to a pair of die cast aluminium plates. This exclusive and well tested configuration allows a perfect balance of weights to be achieved, as well as optimum torsional and longitudinal rigidity values. The frame has been specifically designed, seeking to raise the bar for the segment in terms of handling, without neglecting high standards of stability at the high speeds which the powerful twin cylinder is capable of reaching. The steel rear subframe ensures extreme solidity for trips with a full load, while the lateral positioning of the shock absorber, which connects the frame to the aluminium swingarm, is useful for providing the right amount of space for the exhaust manifold, leaving the unit far from heat sources in a position which favours any adjustments that may be required. Caponord 1200 has a manually adjustable shock absorber in spring preload and in rebound hydraulics as well as a completely adjustable USD fork (rebound, compression and spring preload) with 43 mm stanchions made precious by cast shell mounting brackets. The extremely lightweight aluminium wheels, both 17 inches, stem from the ones which equip the super sport RSV4 and they contribute to reducing gyroscopic moments of unsuspended weight to a minimum, all to the advantage of handling. The wheels are shod with tyres designed specifically for this type of bike; thanks in part to the generous cross section of the rear tyre (180/55), they are able to accommodate even the rider's most extreme leans as well as ensuring maximum grip on slippery surfaces. The particular sculpting of the tread provides the further possibility of safely tackling light off road routes, in search of a more adventurous type of touring. The Brembo braking system provides a pair of floating 320 mm steel discs and monoblock callipers with 4 pistons and radial connection on the front. The rear mounts a single piston floating calliper that grips a 240 mm disc. An advanced two-channel ABS system which can be disengaged completes the standard equipment. The Aprilia twin cylinder boasts extremely advanced construction technology and a careful study of internal fluid dynamics aimed at improving combustion, decreasing friction and maximizing performance. The engine was the object of some significant advancements, both in software and hardware, in order to obtain more progressive power output from low rpms (to the advantage of comfort) and to enhance riding pleasure thanks to even higher torque values (to the advantage of fun), at the same time improving fuel economy. The final drive ratios contribute to increasing top speed, thereby allowing the engine to turn at lower rpms while travelling on the motorway, saving fuel and increasing comfort. A child of the experience Aprilia has gained in racing, which has resulted in an amazing 52 world titles in just a few years, the ultra compact twin from Noale is a work of Italian art even from an aesthetics point of view. Credit for this goes to the great efforts of the engineers in imagining an ultra modern engine where the data transportation system travels through a CAN line which has the benefit of decreasing the amount of electrical cables needed. The 690W current generator is more powerful and capable of powering the various electrical accessories in the rich options catalogue without any problems. Aprilia was the first to believe in the Ride-by-Wire system, the electronic type accelerator introduced on the Shiver 750 as far back as 2007, the fruit of extremely sophisticated technology, once reserved only for competition bikes, which helps the rider to get the most out of the bike's performance potential. On the Caponord 1200 the level of effectiveness and reliability of this system has reached a new peak. The RbW system dialogues perfectly with the engine ECU, managing the power in the best possible way at each point of the power output range in order to have jerk-free manageability at low RPM, extreme responsiveness at medium RPM and exemplary spurts at high RPM. An efficient engine also provides the indisputable advantage of optimizing fuel economy. With its triple maps (Rain, Touring and Sport), which the rider can select even with the bike in motion, Caponord 1200 provides the possibility of having a bike with three distinct personalities, able to instantly adapt to any possible condition and preference. The rider needs only close the throttle and press a button to choose the desired setting. Level 2: suitable for the city and touring and in general to manage the engine's great power on any route. 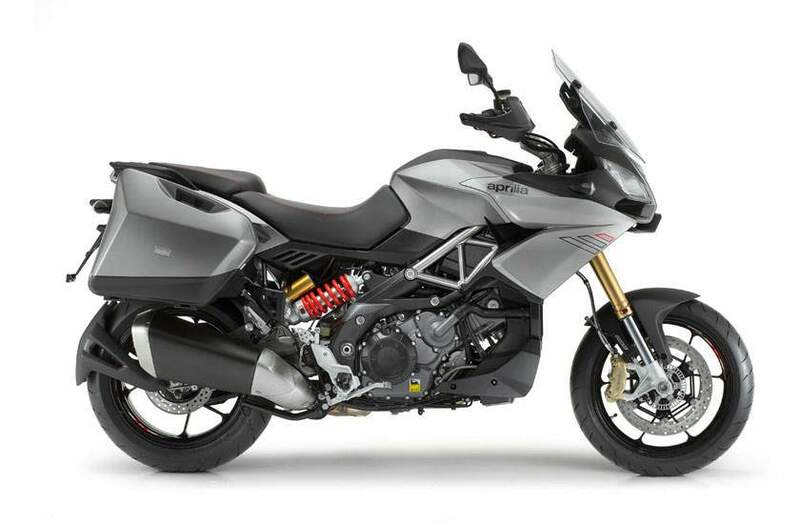 Caponord 1200 is also available with the Travel Pack package which includes aDD (Aprilia Dynamic Damping), ACC (Aprilia Cruise Control), centre stand and side panniers. aDD (Aprilia Dynamic Damping) is dynamic semi-active suspension system developed by Aprilia and protected by four patents, the reference point in motorcycling on a global level where technology, efficiency and reliability are concerned. After aPRC, the highly sophisticated "package" of electronics systems which equips the RSV4 and Tuono V4, once again Aprilia demonstrates that they are pioneers in the field of electronics applied to bikes, introducing the suspension system which uses automotive components to guarantee maximum reliability: a glance to the future, thanks to its vast possibilities of development and diversified applications. The aDD system measures the energy transmitted by bumps on the road surface to the bike and adjusts the hydraulic fork calibration and shock absorber in real time to minimise accelerations on the frame and consequently maximise comfort. To achieve maximum performance at any fork and shock absorber operating frequency, aDD uses a patented "comfort oriented" algorithm which combines the principles of the well known skyhook and acceleration driven damping algorithms. In addition to comfort, rideability is also optimised and safety is increased thanks to further software strategies which are tied directly to the rider's actions. In fact, the system recognises the riding phases (acceleration, throttle release, braking, constant gas) and adjusts the basic fork and shock absorber settings thanks to yet another patent which allows specific hydraulic calibration curves to be defined within the adjustment range. The high precision of the system is entrusted to a selection of sensors which are derived from the automotive world and which allow the fork and shock absorber extension speed to be measured with maximum accuracy. In this field Aprilia has patented a unique solution for measuring the fork extension speed through the use of a pressure sensor. The Travel Pack includes a built in piggy back shock absorber, electrically adjustable in spring preload to 4 predefined positions, indicated by specific icons on the digital instrument panel: rider only, rider with passenger, only rider with panniers and rider and passenger with panniers. Exclusive patent of the Aprilia system is then the automatic preload control mode for the spring. Once this option is selected the system is able to detect the bike's load by itself (weight of the fuel, rider, passenger, luggage, etc.) and automatically adjust preload to the optimum value for the correct balancing of the bike. Aprilia Cruise Control allows the desired speed to be set and maintained even on uphills and downhills, without touching the throttle control. The system disengages automatically if the rider touches any of the brake/clutch Cruise Control commands and is very useful on long motorway routes because it helps save fuel and makes the ride less tiring. It is a perfect ally to eat up miles stress-free astride the Caponord 1200. The instrument panel that equips the Caponord 1200 is completely digital: The full LCD combines the speedometer, rev counter, total and two trip odometers, fuel level and coolant temperature. There is also a selected mapping indicator (S,T,R) as well as the shock absorber electric spring preload indicator (Travel Pack). The engaged gear is also indicated, as well as the aTC level adjustment and heated handgrip operation (available as a separate option). The range of indicator lights on the side includes the fuel reserve warning light and the ABS, aTC and aCC activation/deactivation indicators (Travel Pack).